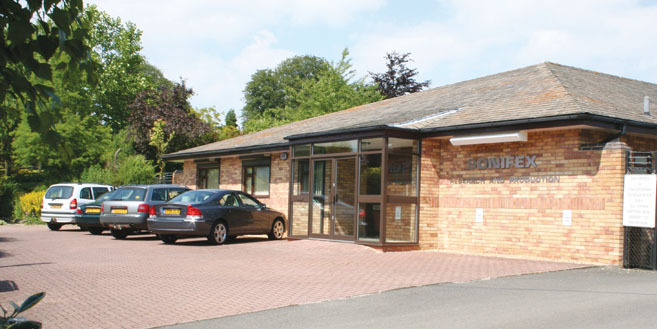 The company became a limited company in 1983 and the operation moved to new purpose built premises at Irthlingborough, Northamptonshire, during 1986. In 1987, the size of the premises was doubled to 11,000 square feet of production space with excellent working conditions and facilities for recreation. An extension was completed in February 1998, adding another 7,000 ft² of engineering and storage space. Paul retired as Managing Director in 1994, when Marcus Brooke took over. The company presently employs forty three staff with a high percentage of those dedicated to R&D projects entirely motivated from within the company. Over 90% of British radio broadcast studios have in the past used some form of Sonifex equipment and the company exports on average 50% of its products. Sonifex supplies equipment to over 60 countries world-wide and is recognised for the quality and reliability of its designs and finished equipment. Sonifex manufactures telephony equipment and is authorised as a BABT (British Approvals Board for Telecommunications) certified manufacturing facility. Sonifex also operates a quality system and achieved ISO9002 status in 1999. The name Sonifex was synonymous with NAB cartridge machines, and carts, for playing adverts and jingles on the radio. These products had their heyday in the 1980's & early 90's with the analogue micro HS redesigned as the digital Discart floppy disk cart machine. In 1989 the HY-02 telephone hybrid was developed to enable radio station talk-show callers to be heard more clearly and the HDX2000 hard disk radio automation system was released on Windows 3.11™ in 1994, and developed on Windows 95/98™ until 1998. The Sovereign analogue radio broadcast mixing console was developed in 1995 together with the DHY-02 DSP based telephone hybrid. 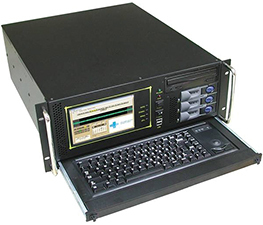 1996 saw the release of the Sentinel 8 channel digital audio logger and the Solutions radio studio furniture, allowing us to sell complete radio broadcast studios. 1999 saw the birth of the Redbox range of Audio interfaces, designed for systems integrators. Between 1999 and 2008 the range has expanded to over 40 different products.The first of the range was the RB-DA6 a 1U rack-mount high performance 6 way stereo distribution amplifier for splitting a source into a number of different outputs. S/PDIF and TOSlink optical level digital audio inputs. In 2008, the Reference Monitor range of 1U rack-mount audio monitors was released. Heralding the start of a new direction for Sonifex, these products offer superb quality audio, comprehensive feature-set and exact audio/visual monitoring in a small rack space. Combining the latest DSP technology with outstanding audio enclosure design to produce monitors of the highest standards with exceptional sound quality, a comprehensive feature set and good looks in the rack. to give the best possible performance at a reduced price. Yet another innovative design was added to the Sonifex range of products in 2009, the SignalLED Studio Illuminated Signs. The signs are designed for installers and because the sign itself contains the control electronics, and RGB LEDs are used, it can be simply configured onsite. The Reference Monitor Meters are a range of freestanding and 1U rack-mount precision meters offering accurate, high resolution metering of between 1 and 4 stereo audio sources. Each stereo source is auto-switching between either analogue or digital AES/EBU format with sample rates up to 192kHz accepted. A innovative addition to the console range is the S1 Digital/Analogue Radio Broadcast Mixer.This is a high performance compact, low cost, fixed format mixing console designed for on-air radio use. It can be fitted flush into a desktop or can be rack-mounted by the addition of optional rack ears. To the Talback and Commentary range, Sonifex have introduced the CM-CU21, CM-TBU and the CM-TLL. The CM-CU21 is a rugged desktop commentator unit for two commentators and a guest providing microphone inputs/outputs, return audio circuit inputs, comprehensive headphone monitoring and talkback facilities. With an extensive feature set the CM-CU21 is perfect for commentary at outside broadcasts and sports events. The CM-TBU Line-Powered Telephone Balance Unit is compatible with all analogue direct exchange lines and provides a 4-wire communications system to interface with the telephone network.The CM-TLL Line Powered Telephone Line Listen Unit provides a low-loss interface to receive audio from a telephone line. openGear Cards were introduced this year. openGear is an open-architecture rack system developed by Ross Video, a leader in video technologies, to provide a standard rack-based platform on which companies can develop card-based audio & video products. 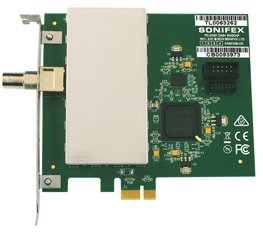 The adoption of openGear based cards by Sonifex allows customers to choose Sonifex cards as part of an overall terminal equipment solution. Yet more new Redboxes this year including: delays, a voiceover monitor ; tone generators ; a silence switcher and the introduction of the new Video 3G, HD & SD-SDI models, including embedders/de-embedders and the Dolby® encoder and decoder . Still in the familiar Redbox chassis offering rackmounting as standard and a universal AC power supply, these new video Redboxes use latest technology components to offer embedding and de-embedding for analogue and digital audio signals into and out of all 3G, HD and SD-SDI video signals, respectively. 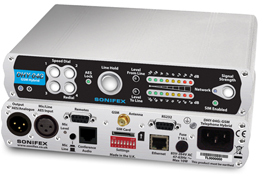 In 2011, Sonifex further expanded the Redbox range with the introduction of the Dolby® E Encoder & Decoder. The Redbox RB-VHDDD8 is a Dolby® E & Dolby Digital Decoder and De-Embedder. It de-embeds 16 channels of audio within any audio group of an SDI video signal and a further 2 which are sent to the Dolby® Decoder. Up to 10 channels from the decoder or any of the 16 channels from the de-embedder can then be re-embedded onto either of the two SDI outputs and also transmitted on a BNC or D-type situated on the rear panel. The new Redbox RB-VHEDD8, which is a Dolby® E Encoder and Embedder, encodes 8 channels of audio into two channels of an AES/EBU digital audio stream which is then embedded onto any of the available groups within each of the two video output paths. The encoded Dolby E bitstream is also available via a dedicated output on the rear panel. The audio inputs to the Encoder can be selected to come from the external digital audio inputs or from embedded audio contained in the incoming SDI input. The outputs from the de-embedder can also be re-embedded into the video outputs, along with the encoded inputs. Also, this year, the Pro Audio Streamers which are a range of three IP to audio and audio to IP streamers which have professional analogue and digital inputs and outputs. They allow audio to be streamed around a building, wan or lan using IP audio and CAT5 cabling infrastructure. The PS-SEND converts an audio input to an IP stream. The PS-PLAY reads an IP stream and outputs to balanced and unbalanced audio line levels. The PS-AMP reads an IP stream and outputs audio to stereo speakers. 2012, saw the introduction of a new small simple radio mixer for novice and professional users…the S0 Radio Broadcast Mixer. The RB-IPE IP Extender for GPIO & Analogue Control Signals which is a 1U rackmount unit designed to provide remote control of GPIO and analogue control voltages over an Ethernet network. Configured using a built-in web server, two units can control each other across an Ethernet network, or a single unit can be controlled via Ethernet commands and the web server interface. The unit can be used in any position where you need to remotely acquire GPO signals or remotely control equipment, for example controlling equipment at unmanned posts, outstations or transmitter sites. The CM-CU1 Commentator Unit 1 Commentator & Line Input which offers the same high quality, robust specification as the CM-CU21, with a feature set tailored to single commentator applications. It provides a fully featured commentator position and a line-level input. The unit has an individual commentator output, with an additional output providing a mix of commentator and line input audio. A limit indicator on the main panel shows when the adjustable limiter on the main output is active, and a bright 21 segment LED PPM meter, which can be disabled, shows the main output level. The CM-TB8 8 Channel Talkback Control Unit which is a powerful and highly flexible self contained communications unit allowing multiple 4-wires and IFBs within a single 1U rack space. It offers easy connection to any industry standard talkback system including the Sonifex CM-TLL line listen unit plus the CM-CU1 and CM-CU21 commentator units. CM-BHA headphone amplifier with limiter & loudspeaker , for use in live applications such as in-the-field news reports. The CM-BH4W uses audio transformers at its input and output, providing galvanic isolation and ensuring that communications are loud and clear. It can operate in 4-wire and IFB modes with an AGC to maintain output level, using a talk switch which can be latching or momentary. The CM-BHA has a wide incoming signal gain and an adjustable limiter to prevent and indicate excessive levels. Both units have a long battery life (up to 200 hours on one 9V battery) and a low battery warning LED. We complimented our existing CM-TB8 8 channel talkback control unit with two new add-in cards: The CM-TB8T which extends the talkback capability of the CM-TB8 by allowing telephone calls to be made and received on two independent analogue direct exchange or PSTN lines and the CM-TBG which is a dual GSM telephone expansion card which allows mobile telephone calls to be made and received via two independent quad band mobile telephone modules. The web server provides access to features including network selection, telephone number storage and phone logs. The RB-AES4B3 AESID3 splitter with BNC connectors . This is a passive, quad “one-to-three” splitter housed in a 19” rack with each bank designed to split a single AES3ID digital audio source to up to three destinations. The RB-AES4X3 AES/EBU splitter with Neutrik XLR connectors is a passive, quad “one-to-three” splitter which splits a single AES3 digital audio source to up to three destinations and the RB-MS4X3 microphone splitter is a passive, quad, “one-to-three” splitter for distributing a single microphone or line source to up to three destinations. These are also available in a small form factor as single three way splitters: the CM-AESB3 AES3ID splitter (BNC) , the CM-AESX3 AES/EBU splitter (XLR) and the CM-MS3 microphone splitter . Also new to the Redbox range is the RB-SD1IP silence detection unit with Ethernet & USB , which offers all the functionality of the existing RB-SD1 with several extra capabilities. Ethernet connectivity allows finer set up and control via a browser based GUI together with a real time view of signal levels and alarm statuses. SNMP V1 is implemented so that the unit can be controlled by existing network management systems and GPI pins enable the generation of SNMP traps on behalf of other, non-networked, hardware. A front panel USB port can hold a pre-recorded message which the unit can play out in the event that both main and auxiliary signals fall silent. The RB-FS82 audio failover switcher is an important tool in many critical areas in telecommunications and broadcast chains. The device has 8 main + 2 standby, stereo analogue audio, AES/EBU digital audio and RS232 connections (both inputs and outputs) and is used for switching of program sources to a standby destination in the event of a destination failure, or for switching of program sources, including standby sources, to destinations in the event of source failure which would typically be audio decoders at a transmission site. And the RB-VHDA2x4 is a 3G/HD/SD-SDI 2 input, 8 output video distribution amplifier for re-clocking and distributing up to two 3G, HD (high definition) or SD (standard definition) SDI sources. 2014 brought more Redboxes, the GSM telephone hybrid, radio capture & sound cards and the Flashlog 8 which is a multi-channel logger. The RB-DA24MD 24 Way Mono Audio Distribution Amplifier is a 1U rack mount high performance 24 way audio distribution amplifier with 2 inputs which can be each individually routed to 12 outputs, or mixed and routed to all 24 outputs. The RB-DDA6A3 6 Way Stereo AES3ID Digital Audio Distribution Amplifier is used for distributing AES3id digital audio, repeating both the audio data and the status information of the input whilst re-normalising to standard digital audio levels. It has a single BNC AES3id audio input which is distributed to 6 BNC AES3id audio outputs. The RB-AEC Acoustic Echo Canceller is a 1U rack-mount acoustic echo canceller primarily designed for the benefit of studio personnel for television and radio. When a studio presenter’s microphone signal is played out through a monitor speaker in the control room, it can be picked up by the control room microphone(s) and returned to the presenter’s earpiece as an undesirable echo. There are two new telephone hybrids. The DHY-04 Single Automatic Digital TBU, AES/EBU & Analogue I/O With Ethernet which is an enhanced redesign of the DHY-03 , the best performing telephone hybrid in the world. It now has auto-sensing combined analogue and AES/EBU inputs and outputs, front panel speed dial buttons, together with an Ethernet interface to allow web browser access to the configuration and internal settings. All whilst still retaining stunning line balance rejection figures. And the DHY-04G Single Automatic GSM Hybrid, AES/EBU & Analogue I/O With Ethernet with the ability to be used on a GSM cellular (mobile) phone network instead of a telephone (POTS) line. The DHY-04G can accept a SIM card in the rear panel slot and by connecting a suitable GSM antenna, the DHY-04G can receive and make high quality broadcast calls over the cellular network, converting the GSM call to the 4 wire audio signal to and from a connected mixing console. The GSM module used in the DHY-04G is quad-band GSM, so it can take and make calls on any 2G network. There is a range of three radio capture cards. These consist of the PC-DAB1-4 Multi-Ensemble DAB+/DAB Radcap PCle which receives and decodes the entire contents of up to four DAB+/DAB ensembles; the PC-FM6-32 FM Radcap PCle designed for simultaneous recording of multiple radio stations; and the PC-AM6-32 AM Radcap PCle designed for simultaneous recording of up to 32 radio stations. There are two professional sound cards, namely the PC-DIG4 Digitorc 4, 4 Stereo AES-3 I/O PCIe which has four AES-3 stereo input and output channels on a Windows platform; and the PC-AUR44 Auricon 4.4 PCIe Analogue Sound Card which is a professional quality 4 stereo input and 4 stereo output analogue PCIe audio card. 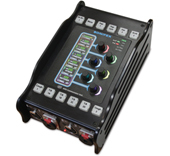 Finally, the PC-FL8 Flashlog 8 is a configurable, ultra powerful multi-channel logger which uses the PC-AUR44 and PC-DIG4 sound cards, IP based line inputs (Axia or Wheatstone), radio capture cards and internet radio streams, in a rugged, reliable 4U chassis to continuously log up to 2 years of radio broadcasts or audio. 2015 introduced a number of new products: the AVN-GMCS IEEE1588 PTP Grandmaster Clock with GPS Receiver which is a PTPv2 grandmaster clock for use with AoIP applications. IEEE1588-2008 PTPv2 (precision time protocol) is used to synchronise all the nodes within a network. To achieve this one of the nodes must become the master clock and distribute time packets to the others. The AVN-GMCS is designed to perform this role simply and accurately, enabling sub micro second synchronisation between all nodes. RAVENNA (of which AES67 is a subset) allows for the distribution of audio across a network. For this to be possible, each of the nodes needs to be time synchronised with one another. Ravenna uses PTP time stamping to achieve this, which distributes the network time but also works out the latency involved in the delivery and adjusts the time at each node accordingly. Unit configuration is achieved easily either with the front panel controls or the webserver, including the setup of the PTP profile. More Redboxes added to the audio interface collection: the Redbox RB-MSP6 6 Way Phantom Power Supply is a 1U rack-mount phantom power supply, designed to be used in conjunction with up to six RB-MS4X3s, providing mains input redundancy to ensure the target microphones remain powered in the event of a single mains failure. Two mains AC inlets power separate 48V supplies that are diode fed to six locking DC connector outputs. Each output connector is individually protected with a resettable fuse rated at 50mA, so a fault on one output will not affect the others. And, the RB-FS42 Audio Failover Switcher, 4 Main I/O, 2 Standby I/O , which is a smaller channel count version of the RB-FS82, offering a lower number of inputs and outputs. It is a more cost effective solution where failover is needed for a smaller number of sources/destinations and supports all of the features of the RB-FS82. 2016 introduced more of the AVN range of products which are IP audio based talkback intercom units with an advanced feature set, allowing them to be used in multiple applications. With both 4-wire analogue inputs and outputs, as well as AoIP network audio connectivity, the AVN-TB units can be used with existing legacy 4-wire systems and with new AES67 AoIP networked audio infrastructure. Additionally, all audio is at 48kHz sample rate, meaning that it’s broadcast quality audio as standard. RAVENNA (of which AES67 is a subset) allows for the distribution of audio across a network. The AVN range use RAVENNA as the communication method providing compatibility with other AES67 systems. New this year is the AVN-TB10AR is a 10 button intercom meaning that 10 other ‘stations’ can be defined, one per button, for communication. Comms can be made as a Talk action, a Listen action or a duplex Talk/Listen action to/from each station. Coloured LEDs in the buttons help to show which action is being used and there is also a Callback button for when you’re unavailable to receive a call. Also, the DHY-04HD Single Automatic HD Voice & GSM Hybrid, AES/EBU & Analogue I/O With Ethernet.The new DHY-04HD is an HD Voice & GSM hybrid for handling high quality voice calls, ideal for studios in remote locations, for OB vans and trucks on the move, and in emergency situations where a telephone landline can’t be guaranteed. Using a 3G or GSM cellular network, it can receive and make high quality broadcast calls of 7kHz bandwidth, converting the 3G or GSM call to the 4 wire audio signal to and from a connected mixing console. The module used in the DHY-04HD is quad-band GSM and 5 band UMTS/HSPA+, so it can take and make calls on any 2G GSM, or 3G network. 2017 introduced more products to the AVN range. The AVN-TB20AR 20 Button Advanced Talkback Intercom, AoIP Portal and theAVN-TB20AD 20 Button Advanced Talkback Intercom, AoIP Desktop Portal. The AVN-TB20AR is a 2U rackmount 20 button version of the AVN-TB10AR with the same specification, but more station buttons allowing greater communication for larger facilities. It also has ‘GPI/O’ and ‘Phone’ buttons for remote control of external equipment and Sonifex DHY-04 telephone hybrids, useful in an OB truck or production gallery. The AVN-TB20AD is a desktop version of the rackmount AVN-TB20AR intercom with a smaller form factor and an elegant sloped front. It has the same feature set and connectivity (Except for an additional headset connector on the rear of the AVN-TB20AR). Finally, the PC-AD2 2 Stereo Analogue I/O & 2 Stereo AES-3 I/O PCIe Half Height Sound Card. The new PC-AD2 is a half height PCIe sound card with dual stereo analogue inputs/outputs and dual stereo AES-3 digital inputs/outputs. It has full Windows 7/10 driver support. 2018 introduced yet more AVN (AES67, AoIP) products. The award winning AVN-PXH12 2 x 12 Channel Mix Monitor, AoIP Portal. The AVN-PXH12 is a world first – it can simply and effectively simultaneously monitor and mix up to 24 AES67 AoIP sources in a compact 1U rack to a speaker/headphone combination in a quick and intuitive way. Any AES67 audio channels on your network can be assigned to input channels on the unit and mixed down to analogue outputs, a headphone output and built-in speaker. The AVN-TB6 6 Button Talkback Intercom. This is a 6 station talkback intercom using AES AoIP ideal for areas with reduced communications needs, plus the AVN-TB6D 6 Button Talkback Intercom, Desktop. The AVN-TB6D is a desktop version of the AVN-TB6 intercom with a smaller form factor and an elegant sloped front. It has the same feature set and connectivity. The AVN-PX8X4C 8 x 4 Channel Mix Engine, 24 Inputs, 16 Outputs, AoIP AES67. The mix engine houses the hardware where the complex routing, mixing and DSP functions are performed. This resilient 2U rack has dual hot-swappable AC power supplies and both 1Gb Ethernet & SFP ports. The AVN-MPTR Technician Remote Controller. The AVN-MPPR 4 Channel Presenter In-Ear Monitoring Remote Controller, AES67. The presenter remote provides the mixed audio to the presenter’s earpiece via front panel ¼” & 3.5mm headphone outputs, together with a rear panel XLR output. Multi-Channel Audio Interfaces Using AES67 AoIP - AVN Portals. These are a range of 3 audio interface portals which mix and route analogue, AES3, microphone & AES67 stream inputs to analogue, AES3 & AES67 outputs: the AVN-PA8D 8 Stereo Analogue Line Inputs & Outputs, AES67 Display Portal, the AVN-PD8 8 Stereo Digital Line Inputs & Outputs, AES67 Portal and the AVN-PM8T 8 Mic/Line Inputs, 8 Line Outputs, Terminal Block, AES67 Portal. Each of the portals can be ordered either with the input/output metering displays (D version) or without and there are two options for rear panel connectivity - with XLR/RJ45 connectors or terminal block (T version) connectors. All units have input and output level trim and output limiters. Passive Packs.The passive packs are a range of small utility products which use transformers to change audio input & output impedances and levels and to distribute audio signals. Finally, the AVN-CU2-DANTE Dante® Commentator Unit, 2 Commentators. 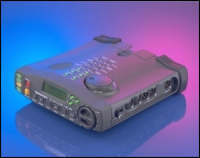 The AVN-CU2-DANTE is a portable commentator unit. Using Dante® AoIP together with 4 wire connections the AVN-CU2-DANTE bridges the gap between old and new technology, allowing the ease of connectivity & functionality of AoIP, together with the legacy connections needed to operate with the existing infrastructure in some stadia and sports grounds. The AVN-CU4-DANTE is a portable commentator unit using Dante® AoIP. It is a dual version of the AVN-CU2-DANTE providing four mic/line inputs with a wide, adjustable gain range and four stereo headphone outputs with lockable jack sockets, suitable for operation by three or four commentators.